This article is about a specific region named the Redwood Forests on The Island. For the biome itself, see Redwood Biome. For the Redwood Forests on The Center, see Redwood Forests (The Center). For the Redwood Forests on Ragnarok, see Redwoods (Ragnarok). The Redwood Forests (formerly known as Deep Island) is a region in the southern center of The Island. It consists of the Redwood Forest Biome and features redwood trees with wide trunks and high treetops which can't be destroyed. These trees are the only trees in the game where players may make a tree base, by using Wooden Tree Platforms and Metal Tree Platforms. In the forest center, the Red Peak rises in the air. Surrounded by a river to the north and the swamp to the south, the Redwood Forests form the center region of the Island. Most creatures from both the Snow and Swamp Biome can be found in the Redwoods. 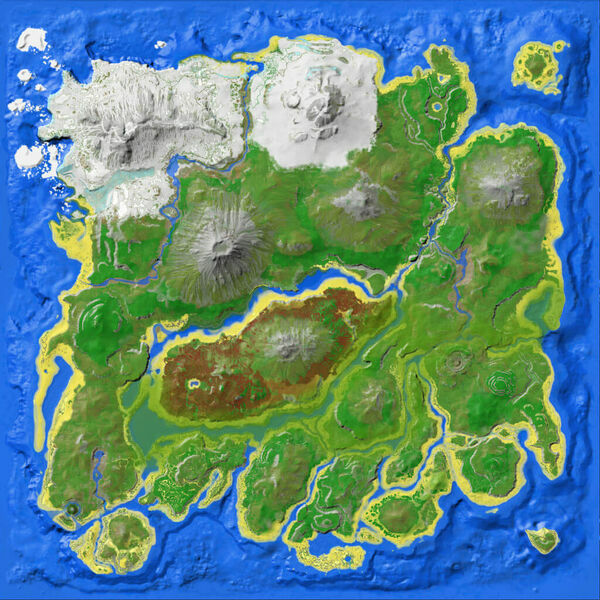 Prior to v243, this region was called Deep Island and was covered by a normal jungle forest. It has since been renamed and replaced with a Redwood Forest. This page was last edited on 4 April 2019, at 07:14.